But recently, I wanted to use the designer paper in the pinker tones and decided to simply case myself for this card. I started with a base of Crumb Cake cardstock that I ran through the Big Shot with the new Framed Tulips embossing folder. I sponged the edges with Crumb Cake ink. Then I pulled out my FREE Sale-A-Bration stamp set Bliss and stamped the flourish image with Always Artichoke ink on the card front. Next, I cut my designer paper flowers with the Big Shot and the new Fun Flowers Die, then sponged them all with more Crumb Cake ink. The petals were all curled with my Bone Folder and I attached the flowers together with a brad in the center. 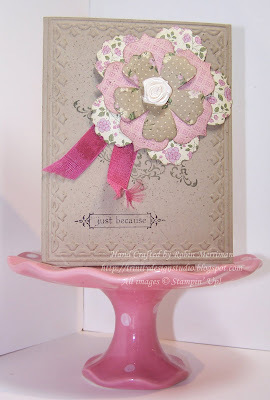 The Very Vanilla Rosette was added with a Mini Glue Dot and I attached the flower to the card with Stampin' Dimensionals. The only SNAIL I used on this card was to attach the small piece of Rose Red Seam Binding under the flower. The greeting is from the Notably Ornate stamp set and I just inked it with Early Espresso to stamp it. For a final touch, I used my Color Spritzer Tool to spritz on Crumb Cake ink. I'm not totally decided, but I think I may like this version better than the first one! What do you think? 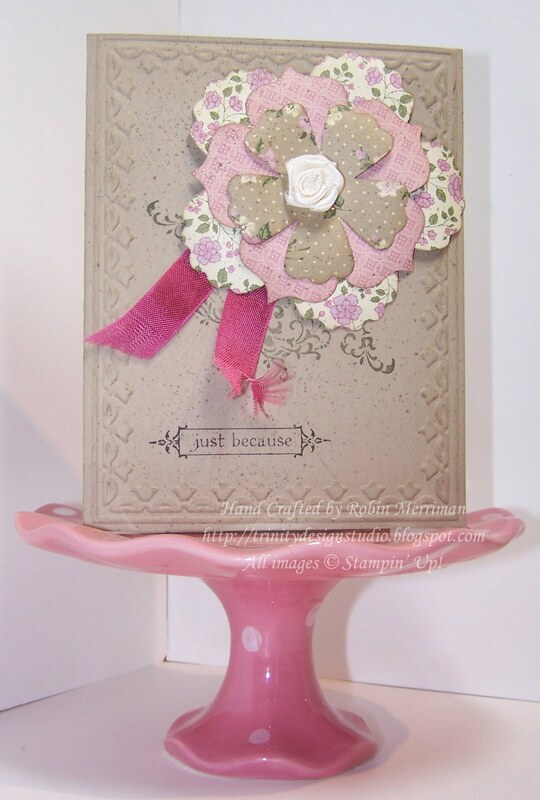 As always, if you need to purchase the supplies to re-create this or any of my other projects, my Stampin' Up! Online Store is open 24/7. Just click the Shop Now button to get started! All my online orders this month will receive THIS card from me! HI Robin - I have an award for you on my blog - http://monikastamp.wordpress.com/2011/02/23/stylish-blogger-award/ - the Stylish Blogger Award. You are an inspiration! Post the award on your blog, tell your readers 8 things about yourself, and pass it on to 8 others. Have an awesome day! Hi Robin. I am sooo casing this! I usually like blue better than pink, but i love how warm the pink card is.